Jordan is a proud and welcoming nation, keen to show off its spectacular landscape and fabulous history. In 2016 it won a special accolade. Rough Guides included it in its top ten list of countries to visit. I was there recently. This is my must do list. It includes an outstanding Roman city, the fabulous rose coloured ruins of Petra hewn from the rock, and the place where Jesus is believed to have been baptised. Jordan also offers the greatest free float on earth, in the Dead Sea. The Roman Empire was huge. You can fly for five hours from Britain to Jordan, and find monuments to Emperor Hadrian in both countries. We have his Wall. The great Roman city of Jerash, an hour from the capital Amman, has Hadrian”s Arch, one of many highlights in this, one of the biggest and best preserved Roman settlements in the Middle East. We wandered all morning, through the hippodrome, the amphitheatre where a bagpipe band from the Jordanian army played for us, down an original street under a hundred columns, and around a massive oval Forum. from 2000 year old wheels. Summer events here include chariot racing, legionaries in full armour and fighting gladiators. Petra, high and cool in the mountains in southern Jordan, is a sensation. It was recently named one of New Seven Wonders of the World, The great but mysterious Nabataean civilization built a set fit for Hollywood – the final scenes of Indiana Jones and the Last Crusade were filmed here – but 2000 years too early. Even the buildup is high drama. 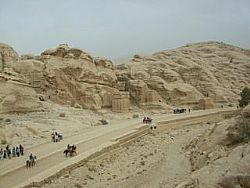 We walked alongside camels and horse-drawn carts down a tight half-mile-long chasm, between towering cliffs, which suddenly opens into a deep, wide space overwhelmed by the mighty temple-shaped Treasury building. cherry, and violet sandstone rock. There are 800 structures to see. You could spend days here. There are hotels in the adjoining town Wadi Musa. Floating on the Dead Sea, 10 times saltier than the Mediterranean, is great fun, But take a good book, as there’s not much to do as you simply lie there. transplanted olive trees, one of them 800 years old. The big, generous rooms, in individual villas, all face the water, and the longest private beach in Jordan. It’s a very sunny spot, but, 1200 feet below sea level, the sun’s rays are filtered by an additional buffer zone of oxygen. I enjoyed a blissful hour in the spa’s pools, including one filled with Dead Sea water. The Baptismal Site at Bethany on the Jordan River – it is the border between Jordan and Israel – is proof that good things do happen in the Middle East. Since the two nations signed a peace treaty in 1994, archaeologists have been able to dig here and discover the original stones leading down to the point on the river where John the Baptist is believed to have baptized Christ. Next to it are the remains of several early Christian churches, built one on top of the other. We stood above this place, powerful and compelling whatever your beliefs. It was serenely quiet. To get there I advise hiring a car. Or book one with a driver from your hotel – we paid £100 for a day. You park a mile away. A shuttle bus, with a guide, takes you to the site. You need a car to reach the top of Mount Nebo, unless, like the prophet Moses, you climb the 2680 feet up from the plain. Deuteronomy records that this was where Moses was shown the Promised Land that God intended for the Jews. Some even say Moses was buried on this mountain. study of the Holy Land. For a quick snack, we repaired across the road to the excellent Dana cafe. traditional cooking of the Bedouins, Palestinians, Egyptians, Syrians and Lebanese. We enjoyed a memorable lunch in the Lebanese House restaurant on the road just south of Jerash. It came with the full range of Middle Eastern mezzes, followed by kebbeh, a delicious concoction of lamb, onions, pine nuts and dried mint leaves. We also liked Hisham restaurant in Wadi Musa, just outside the entrance to Petra. They did a delicious maqloobeh, layers of lamb and onions, eggplants, rice, spices and pine nuts, then turned upside down and wrapped in thin bread. We had good memories too of an Italian meal in the Via Appia restaurant in the Kempinski Hotel Amman. cardamom, in a street café surrounded by locals smoking hubble bubbles. The writer travelled courtesy of Bales Worldwide, flew with Royal Jordanian (Heathrow-Amman), and stayed with Kempinski. This is a travel article, but it would be wrong not to mention the large numbers of Syrian refugees in the region. Since 2011 Jordan has granted refuge to more than 632,000 refugees, mainly from Syria, and continues to demonstrate hospitality, despite the strain on national systems and infrastructure. The Syrian refugee camps of Azraq and Zaatari were built on land provided by the authorities.